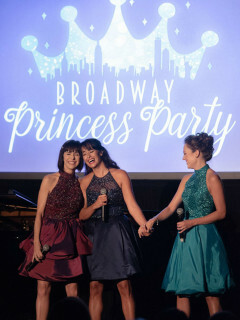 At Broadway Princess Party, audiences can unleash theirr inner princess with Broadway’s original Cinderella, Belle, and Jasmine. Hosted by two-time, Tony-nominated star, Laura Osnes (Rodgers and Hammerstein's Cinderella) and her own Fairy Godfairy, Benjamin Rauhala (musical director extraordinaire), the evening also stars the multitalented Susan Egan (Tony-nominated for Disney’s Beauty and the Beast), Courtney Reed (the original ‘Jasmine’ in Disney’s Aladdin on Broadway), and special guest Adam J. Levy as the show’s Prince of the Evening. The four knockout voices will sing every princess song in the book and share hilarious back-stage stories of their royal antics on stage. Adding to the merriment, princes and princesses ages 7 to 107 are encouraged to dress up in their best royal attire (or cosplay). For VIP ticket holders, the princesses will be available for a meet and greet and autographs following the performance.